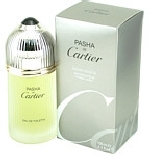 Cartier introduced Pasha in 1992. It is the result of the following top fragrance Notes: mint, citrus and musk. The middle notes are: amber, moss and cedar and the base of the fragrance is: oakwood, sandalwood and oak. Pasha is recommended for casual use. MY HUSBAND & I BOTH LOVE THIS FRAGRANCE AND WITH THIS DEAL I WAS ABLE TO PURCHASE 2 BOTTLES OF PASHA FOR THE SAME PRICE I WOULD HAVE PAID AT A HIGH END STORE. THIS IS THE FIRST TIME I PURCHASED A FRAGRANCE ONLINE--THE ONLY REASON I DID WAS BECAUSE EVEN THOUGH I LIVE IN CHICAGO-FINDING PASHA IS DIFFICULT AT BEST. THIS EXPERIENCE WAS A WALK IN THE PARK. it is a strong scent that lasts.